JUUL, vape, pens, mods, tanks, ENDS…no matter what you call e-cigarettes, they are ubiquitous. If I’m aware of vaping everywhere, you can bet our tweens and teens are, too. Are they able to say No to vaping — over and over again? I did some research and then asked my own teens. Disclosure: This post is in partnership with Colorado Department of Public Health and Environment. Opinions are mine. Our school district’s superintendent reports that Colorado’s youth are vaping at twice the national average. Not something a state wants to rank for. The tiny device can go undetected because it can look benign, like a USB drive, and it can easily be hidden. Juul cartridges come in kiddie flavors such as gummy bear, mango, and cotton candy, and don’t give off an olfactory clue the way smoking tobacco does. There’s a YouTube culture that shares with viewers how to vape and hide vaping from adults. And, alarmingly, 63% of people ages 15-24 are unaware that JUUL contains nicotine. And is therefore addictive and luring kids in for the long haul. Kids tell in their own words how they hide JUUL use and how prevalent use is in their high school (PBS News Hour video). Although we have had early and frequent conversations with our own teenagers, now 17 and 15, my husband and I discovered that both have not only been exposed to vape but have partaken. I asked how hard he tries to stay away. He admitted he has tried vaping, but chose not to keep doing it (hmmmm…mental note to stay vigilant). My husband and I told him this is a good decision, as he gets closer and closer to making all his own decisions and facing all his own consequences. We then addressed the “harmless” misconception by citing some of the negative health effects of vaping. We also vow to keep this conversation going, as we are not so naive to think vaping has suddenly become a nonissue. Our daughter wrote down what she wishes to share with other families. 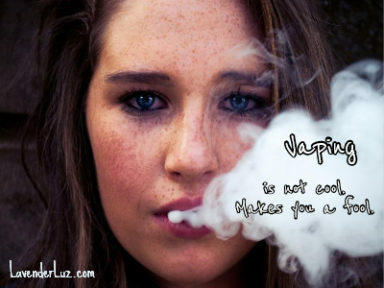 Vaping Part 2: Read an interview with my teenage students here, in which they tell me how vape companies make kids complicit in their own addiction. What’s a Parent to Do with a Vaping Child? The Colorado Department of Public Health and Environment has created a suite of materials to help parents and other caring adults understand the risks of vaping, and prepare them to have conversations with their teens about it. Visit TobaccoFreeCO.org/know-the-facts for these resources and more. We were at the doctor the other day and there were two posters in the exam room about vaping. I walked over to look at one and Matthew (7.5) said, “what does that say about vaping?” I was floored. I asked how he knew about it and he said that his dad told him that it’s bad and to never do it (good job, Brian) and that he won’t. But how did he know what it was from the pictures?!?! He’s 7! I don’t worry too much about Matthew, but Bryson…. he’ll do anything someone tells him to do. Wow. I knew vaping was pervasive, but hearing that your 7 year old is already savvy about it really hits that point home! Vaping is the new epidemic we’re currently facing. Despite all the negative consequences, what people don’t understand is how damn addictive nicotine is and vaping delivers significantly higher levels of nicotine than cigarettes ever could. So the need for early intervention is much greater given that kicking the habit will be a lot harder. Tessa’s words are spot on and important given that countering this requires open and honest conversations that happen again and again. Teens aren’t thinking about the long-term effects, so the focus needs to be on addiction and choices. Not to mention how incredibly silly people look while sucking on something that looks like a flashdrive. I know what you mean! How uncool am I to think that a kid sucking on a flashdrive gizmo looks anything BUT cool. Ugh, vaping. I’m not even sure how prevalent it is among teens here, but I’ll ask my high school coworkers. I’d be interested to know, as fortunately it doesn’t seem too common anymore. A few years ago it was absolutely all the rage, and you couldn’t get away from it. Glad to see that trend pass! And I’m super glad to hear your kids are not vaping—but I can’t believe how grown they’ve gotten!! It’s still hot and heavy here. Good go know it’s a trend that will fizzle out! Yep, both my kids have vaped. As early as 7th grade when I first found out. Worries me more than tobacco frankly. How can mango/strawberry/fruit punch etc artificial flavors be at ALL good for your lungs? Exactly. And it’s not fair to market to them while their brains are still so impressionable. Brains and lungs are pretty vital! It’s powerful to hear it FROM teens — please thank your kids for participating in the post. What a great post! And how sad to hear the comments that it “looks cool” and the resultant peer pressure. That’s exactly the same as smoking in the 70s. And then to read that there is so much more nicotine in vaping. It’s all quite depressing. But I think I’ll send your post to my sister. Just in case. I love your kids! As a teacher, I can tell you that vaping is a huge problem. I’m in middle school, and we have situations with kids getting caught with e-cigarettes and JUUL devices fairly regularly, and it’s treated like a drug infraction. It is scary how small they are and how sneaky you can be. I am always looking around hawkishly like a crazy person every time I smell a strong bubblegum, fruit, or chocolate smell in the hallway — sometimes it’s a body spray or actual gum, but sometimes it could very well be vaping. We had a situation on the bus to D.C. last year where there were kids that were being very, very hyper, like pretty much manic, and when we had to switch busses because ours broke down I was like, “Whose USB is this?” and it…wasn’t. It was a JUUL. But there was no way to know whose it was (although we had our suspicions) because we never saw it happen, and kids are eating a ton of sugar on those bus trips. I hate the way the vape clouds look, I see them out cars ALL THE TIME. And it’s true that kids do it in class — kids visiting from high school say that happens all the time, not just in bathrooms. Sigh. So irritating, because with flavors like bubblegum and chocolate cherry and stuff like that, you KNOW the manufacturers have their key demographic in mind. Not to mention, why make a device so small and sneaky if you want people to use it openly and proudly? Harrumph. What’s sad is I have seen commercials on TV about a former smoker turning to vaping as a way to stop smoking cigarettes. The commercial flat out states vaping is safer than cigarettes! How can they get away with that lie? Recently I saw a video of my son (posted by his friend) vaping and he thinks it’s cool and wants to get his own vape pen. He is 19 and has struggled with asthma his whole life. Thank you for providing some fact sheets I can use when I talk to him, but I don’t know if he will listen. Most of his biological family members smoke and he has a very strong desire to emulate them, so I worry there will be little I can do to stop it. I’m so glad you wrote about this! As I’m returning to coaching high school girls again, this is good information to have. I take my job seriously as a role model and mentor to them. I find it so wrong that manufactures target young teenagers, making it easy for them to hide and giving them such enticing flavors. It’s really sad.